Nearly half a century after strumming his first chords in public at the Rainbow Lounge in Ipswich, this "Route 1 brat" is still rolling up and down the highway to gigs and sessions. Guitarist Bobby Keyes lives in Salisbury, runs his recording studio in his native Saugus, and plays clubs all over Boston and the North Shore. Then there are the jaunts to Hollywood, where he writes and records with friends like pop star Robin Thicke. "The LA thing was 12 years of my life, and then I had a [son] three years ago, and I said, 'I'm out of Hollywood,' " said Keyes, 53. "I wanted to be here and be with him." 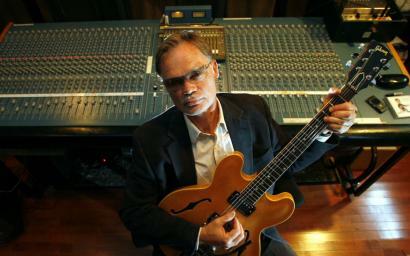 A measure of Keyes' devotion to his instrument: His son is named Django, after the jazz-guitar legend Django Reinhardt. He talked about his career on a quiet summer morning at his studio, which fills an unassuming bungalow on a hillside cul-de-sac not far from Kane's Donuts. His first job this summer is producing and playing on an album for the Mystix, a roots band led by Jo Lilly, formerly of Duke and the Drivers. His trio plays gigs all over the area, and on the side he's exchanging music files via e-mail with the touring Thicke for his next album. Mostly, though, the softspoken Keyes still seems connected to his younger self, the kid from the Walnut Street area in Saugus and later Rowley, whose family included several amateur guitar players. His father, Russell, fought in World War II and suffered frostbite on his hands in the Battle of the Bulge, so he didn't play as much after that. But when Bobby was just 5, his father took him to see a guitarist named Bob Rowe play at a little place on Route 1 in Saugus called the Wigwam (now the Sake restaurant), "and that did it," Keyes said. He got his first guitar soon after, with Rowe as his teacher, along with his father's collection of 100 Chet Atkins records. Keyes first sat in with Rowe's group when he was about 7, he said, and within a couple of years he was gigging up and down the highway, staying one step ahead of the state's Alcoholic Beverages Control Commission for performing in bars while underage. "I was playing the White Star in Rowley with the Jimmy Lee Wills Country Jamboree. I got $15 a night Friday and Saturday nights, up and down Route 1, the Silver Dollar -- the old Mr. Peanut -- in Peabody, all the dives in Lynn. The ABCC would chase me around. After a while my father wouldn't even go, and I'd have different 'fathers' who were there available to me," Keyes said. "I was just this little kid that played guitar, and it's all I've ever done." Keyes has, of course, played some area clubs that are still open. He said he helped christen the stages at the Grog and 10 Center Street in Newburyport. "He was sort of a legend on the North Shore, this little kid who went around playing clubs," said Lilly, who calls him one of the finest guitarists anywhere. "The reason we're working on this project together now is because I'm a writer and I went back to him for lessons because I wanted to learn more chords, and he heard my songs and said, 'Let's try recording a couple,' " Lilly said. "I went to him for lessons, and I've been playing for 30 years." "I like pop music but I grew up on roots music," said Keyes, "but being a session player, you play whatever, so I liked the challenge of pop music. It started years ago when I found myself playing on New Kids records . . . and at the same time doing records with Darlene Love and LaVern Baker and Sleepy LaBeef and Jerry Lee Lewis. One foot in the pop world and one foot in the roots world, and they don't mix. "I remember sitting out in LA on a Jerry Lee Lewis session and all the musicians are sitting around talking about who they played with, and for some reason I mentioned the New Kids, and they said, 'Who's that?' And I said, 'You don't have to like them, but don't tell me you don't know who they are.' "
Keyes said he was one of several veteran session players heard but uncredited on the New Kids on the Block albums. "We called ourselves Old Men on the Curb," he said with a laugh. He was at a studio in the Back Bay a dozen years ago, playing guitar on former New Kid Jordan Knight's solo album, when one of the young musicians took a shine to his playing. "He said, 'You're coming back to LA,' and that turned out to be Robin," Keyes said. "He was 17." Keyes became friends with Thicke, the son of actor Alan Thicke ("Growing Pains"), and his producing partner, Pro J. That led to work with artists like Mya and Lil' Wayne, plus songwriting and guitar credits on Thicke's albums, including his 2006 hit, "The Evolution of Robin Thicke." It brought him several gold records and meant hanging out with people atop the music world like Pharrell Williams and Andre Herrell. Seems like there's some potential for culture shock for a roots-music-lovin' middle-age man from Saugus, isn't it? Keyes laughed and said it's the other way around. "It happens a lot hanging with them, when we go to the hip-hop clubs and I usually get the bouncer going, 'Whoa! What do you want?' And then Andre Herrell would say, 'He's with me,' and then there'd be a little conversation . . .
"I go to Circuit City to buy the record," Keyes said, "and this young lady at the counter when I went to pay said, 'Is this for you?' And I'm like, 'No, it's for my grandmother.' I didn't even want to start with, you know, I wrote the song, and I played on it . . .
"What other people said to me is: 'A white person from Saugus, Mass., on the rap, soul, and R&B charts all at once? I don't think it's ever been done.' So it is pretty strange," Keyes said. "It's kind of surreal, I guess. It's always fine in LA because we're such a family and I was very comfortable with everyone until I walked by a mirror, and then be like, 'Whoa.' What else tipped me off was whenever Alan would come over, he'd stand by the door and go, 'Is Bobby around?' He'd be looking for someone that wasn't 22 to stand next to." Bobby Keyes will play with his trio tomorrow at the Beehive in Boston's South End and at the Salem Jazz and Soul Festival at 1 p.m. Saturday. He will also be at the Top of the Hub, Boston, Sept. 3.